Chicken thighs with a bright lime flavor. Made in the Instant Pot, it's ready in just 20 minutes! 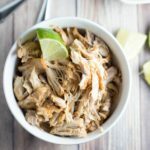 Place chicken in the Instant Pot. Juice the limes and add the juice to the Instant Pot. Then add all remaining ingredients to the Instant Pot. Stir until the chicken is well coated. Close and seal the lid on the Instant Pot and switch the pressure value to sealed. Cook at high pressure for 10 minutes. When finished, let the pressure naturally release for 10 minutes, and then vent the pressure valve to release the remaining steam. Remove the chicken from the pot, place it on a cutting board and shred it with two forks. If you'd like to add a little of the remaining juice from the Instant Pot and toss it in with the chicken before serving, go for it.